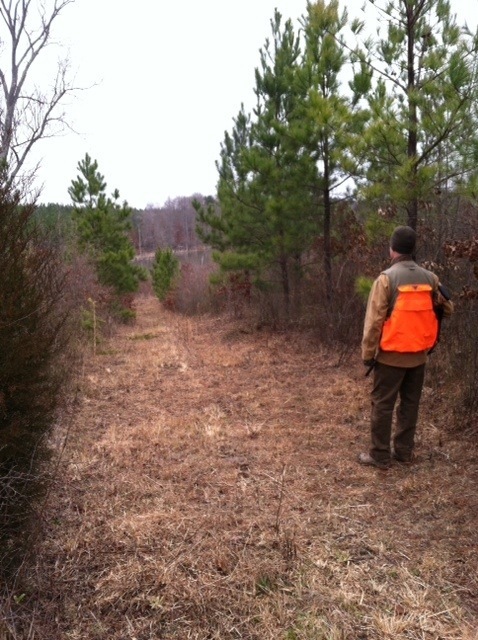 Day two of our hunting weekend began with the temperatures having dropped by 30 degrees. 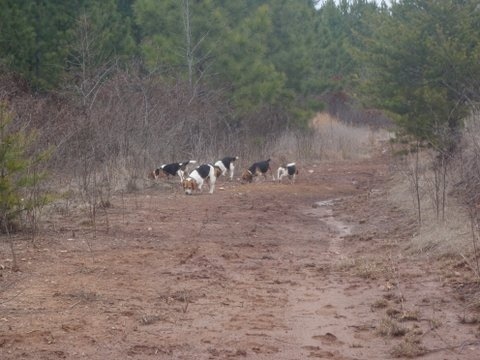 The truck pulled up with five barking beagles ready to go rabbit hunting. This jeep was so cool with two seats in front of the vehicle, two inside and a bench seat above. As soon as we got to where we would go looking for the rabbits, the dogs were let out of their boxes and off they went with noses to the ground. When they caught the scent of a rabbit, immediately the barking and crying and baying would begin. The five little dogs would follow the trail left by the rabbit. I was so worried about the idea of the dogs being right on the rabbits tail, I wondered how do you not shoot the dogs? Well, I soon saw, rabbits are sooo fast! 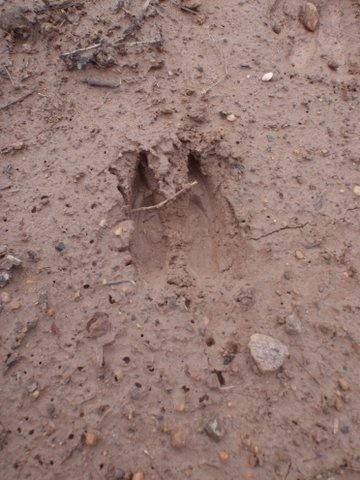 The rabbit would flash by us, then maybe a minute later, the dogs would pass by on the trail. 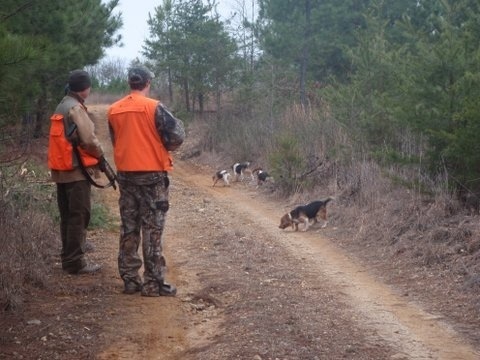 I stayed close to the old seasoned hunting guide and learned so much. When the dogs would hit a scent and start barking like crazy, old Tim would just giggle. “It sounds like a symphony to you, doesn’t it?” I asked. With a huge smile, he agreed. Thomas was the first to get one. The next rabbit turned into a 2 hour chase. Rabbits are smart. 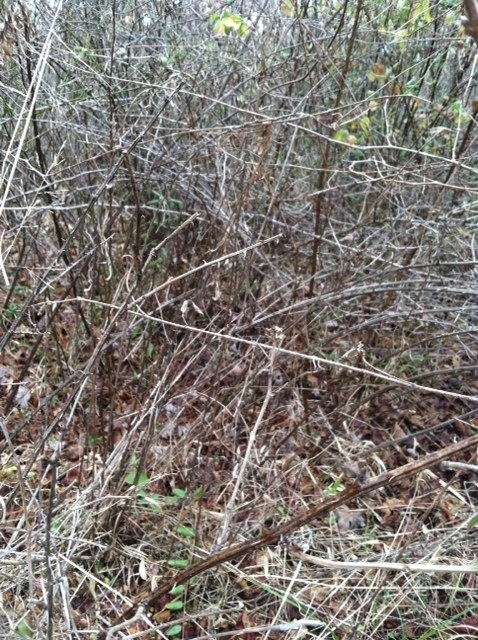 They like to protect themselves in the cover of spiky bramble thickets, like this.It doesn’t look like much, but let me tell you, it can become so thick you can’t get through it without drawing blood. 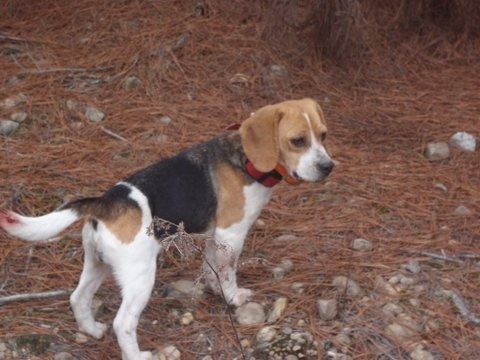 The beagles were surprisingly small just for this reason, to be able to get onto the thicket. The dogs bark like crazy while on the scent. The thing is, is that the dogs can’t tell you where the rabbit is going to show up. So you just have to take a wild guess, taking into consideration the direction the dogs are going and where you think the rabbit is going to cross your path. So you wait. And wait. And wait. You hear the dogs and all of a sudden they appear beside you, which means that rascally wabbit snuck right by you! 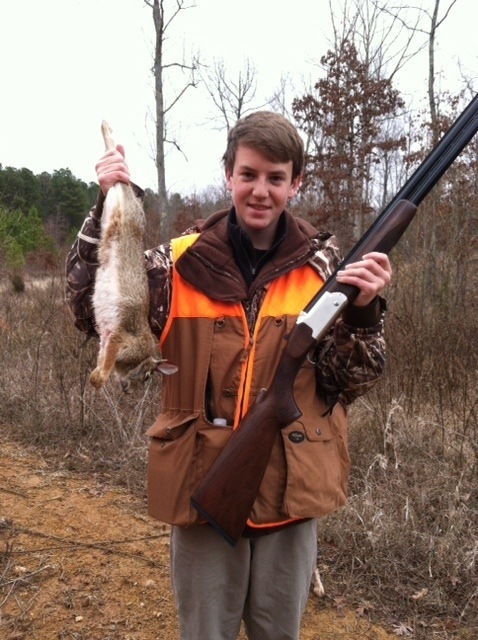 Finally….after a frustrating hunt, Adam brought the little booger down. Ever hear the saying “scared stiff”? Well, this is where it came from. When Adam picked the little guy up, he was straight as a board…scared stiff. I guess I would have been too if I was being chased by dogs, guns are being shot off and I didn’t get a chance to catch my breath for two hours. This sweet girl was quite shy, but of course fell under my spell. All of the dogs got cut all over from the thorny brambles. They love every minute of it! 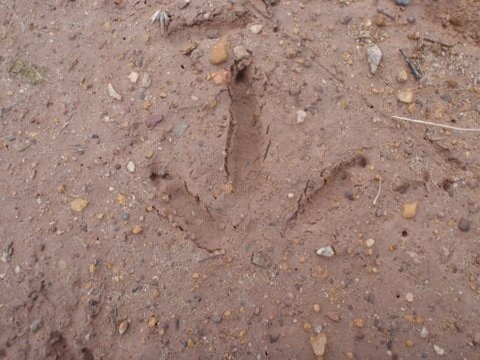 I saw some cool tracks. We were all feeling hungry and tired. 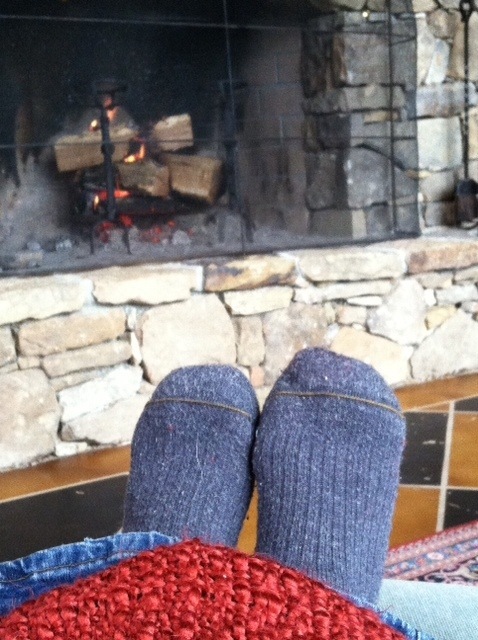 It was a perfect time to take a lunch break back at the bunk house. After filling my belly with a home grilled burger, I decided that I needed to take care of this fire. 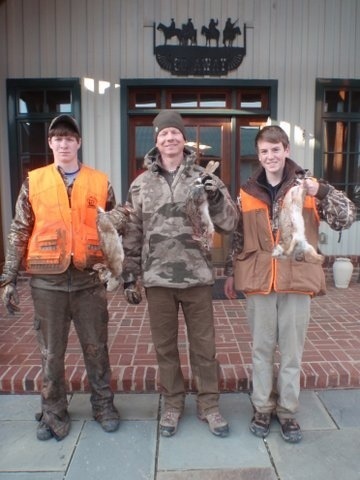 The guys hunted for several more hours bringing back six rabbits in all. 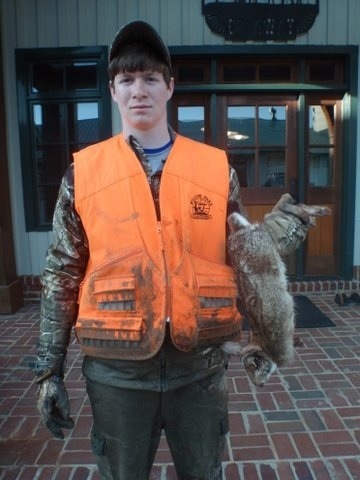 Adam took chase after one rabbit that he saw cross the creek. 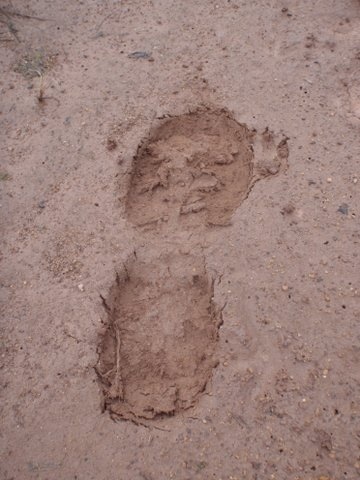 Unfortunately, he isn’t as light as the little hare and sunk waist deep into mud. That lucky rabbit got away. But not this one! 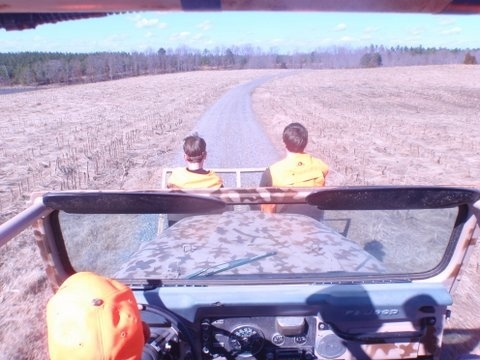 I didn’t carry a gun, but I built some lasting memories with my guys. I am grateful for the bond between us all. Listening to the brothers congratulate each other after a successful shot; seeing the three guys stand side by side ready for the challenge together; and being able to be there to participate in their world with their blessings. 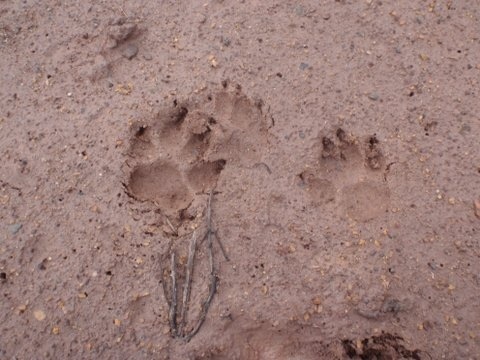 Posted on February 18, 2013 by mary •	This entry was posted in family and tagged dogs, Family, hunting. Bookmark the permalink.